A combination cooking method that uses both moist and dry heat. 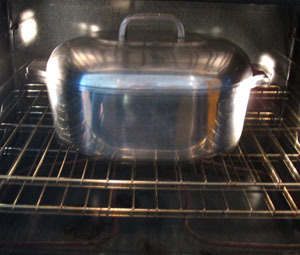 The meat is usually seared off first at a high temperature, then covered with a liquid (including an acid such as beer or wine) and placed covered, either into the oven or on the stove. The combination of heat, liquid and time help to break down the connective tissues in tougher cuts of meat. Braising is the cooking method used in my Beer-braised brisket. If you have any feedback for me or would like to ask a culinary question, check out the contact page. Return to A Lesson in Culinary School.